As these were fairly thickly cut Crisps, they were not as crispy as some thin regular Crisps. An eleven second chomp saw the back of a reasonably large Crisp, and it did not melt away like some. These Crisps were thickly cut and mostly flat in shape. There was not much in the way of oil bubbling. Most were whole and at least a couple of centimetres in diameter. There was also some brown skin on the edges. Now, these would certainly qualify for the ‘severely lacking in character’ Crisps gang. Except... They were green! Yes, a light green, but they screamed Wasabi. A Nose Plunge Test revealed a slight Onion aroma. Oddly, there was not much Onion taste. 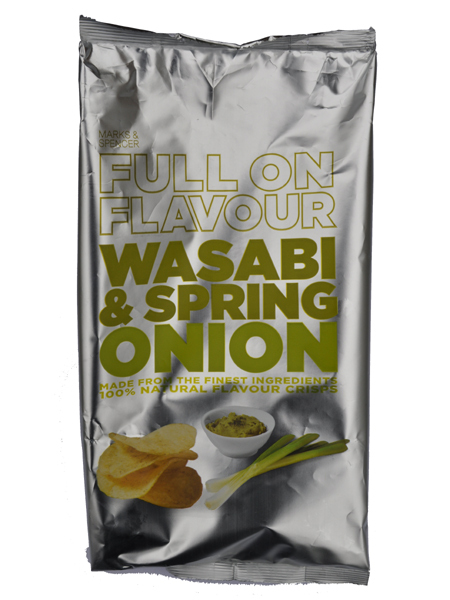 However, the Crisp could be forgiven for this because it’s hard to take the words ‘Spring’ and ‘Onion’ seriously when ‘Wasabi’ is mentioned alongside them! As for the Wasabi, well yes, not strong, but it was Wasabi. It’s a difficult one for Crisps manufacturers – should a hot and spicy Crisp be too hot for some potential purchasers? At Chips & Crisps we are quite strict on this – Yes. If you’re gonna name a hot flavour, make ‘em hot.